Taking a rest in a no parking area! This entry was posted in Uncategorized on July 31, 2014 by deefduke. This entry was posted in Uncategorized on July 30, 2014 by deefduke. Started at 6 am from our house this morning. At 2 pm we were sitting in a campground at Idanha trying to recover from a super difficult day of bicycling. It was super difficult because I am super out of shape, but after the end of the first week I should be as fit as Tim Tebow! It was super difficult because there were lots of long, steep hills that made me pant like a dog and sweat like a horse. I walked several times. As soon as my pedaling is slower than 3 mph I walk. It feels so good to use different muscles and to give my rear end a break. 53 miles today and only 32 tomorrow but tomorrow is almost all uphill. We will camp at Lost Lake. 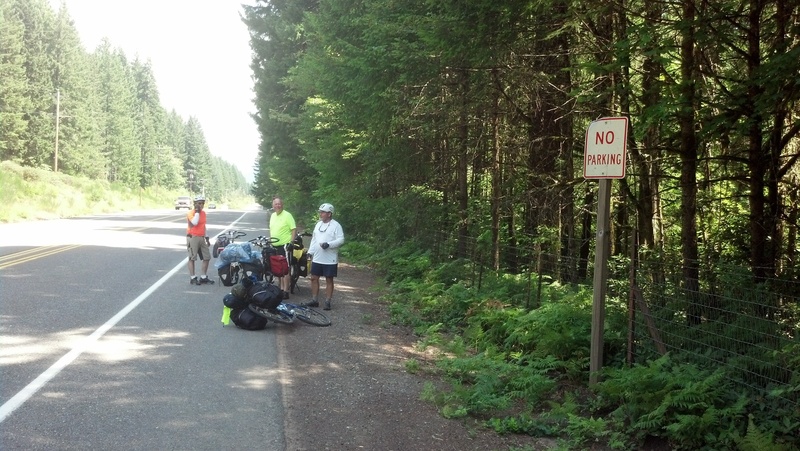 We stopped and rested a lot today, just about every 5 miles for a total of 2 hours. I would probably be dead if we hadn’t! My goal was to be in bed by 9 pm and start the trip well rested, but here I sit in my recliner at 11 pm going over all my maps one more time and trying to think of anything I have forgotten. I am also entertaining a few creative thoughts on how I can opt out of this adventure without looking like a wimp! Oh well, here we go ready or not! This entry was posted in Uncategorized on July 29, 2014 by deefduke. 60 lbs packed in those 4 pretty yellow bags. Tent, sleeping bag, little cook stove, food for one week. Patty will mail food to locations on route each week. French press ( the most important thing) camp cloths, iPad full of books, camera, etc. I am really nervous right now. Hopefully this time tomorrow I will be relaxing in our first camp feeling very confident. This entry was posted in Uncategorized on July 28, 2014 by deefduke. 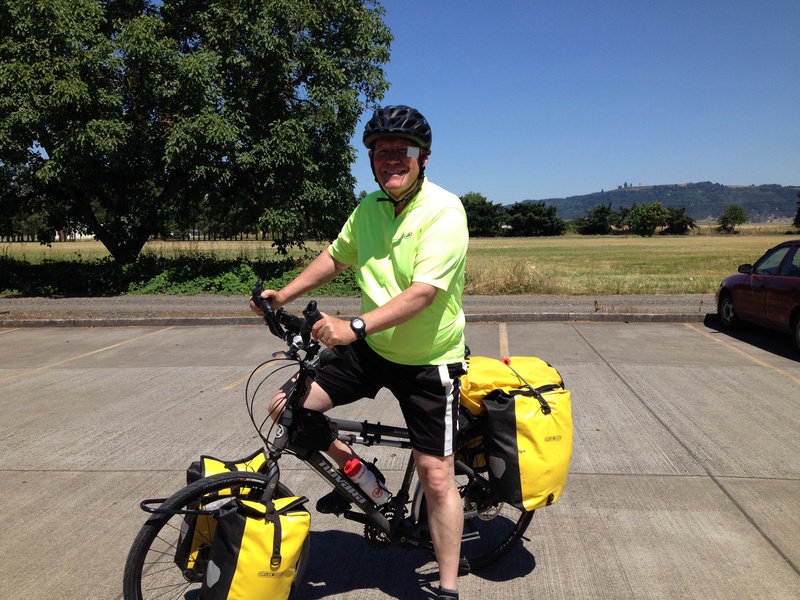 Tuesday I, and a friend John Smith are leaving on a 3,700 mile bicyle trip to Portland, Maine. It will take 2 months and we will average 70 miles each day. We will camp each night and will carry everything we need on our bikes. We don’t have a support vehicle, but no problem because we have cell coverage the entire trip except for about 50 miles and I have a rider on my AAA coverage that covers bicycles. One day to get everything needed for the trip packed into my panniers or saddle bags. I have two in the front and two in the back. The front two will weight 10 lbs. each and the back ones will weigh 15 lbs each and there will be an additional 10 lbs. with my tent on the top of the back bags and the stuff in my handle bar bag, so 60 lbs total. That slows me down about 3 miles an hour. i will be writing a blog entry everyday about our adventures. This entry was posted in Uncategorized on July 23, 2014 by deefduke.